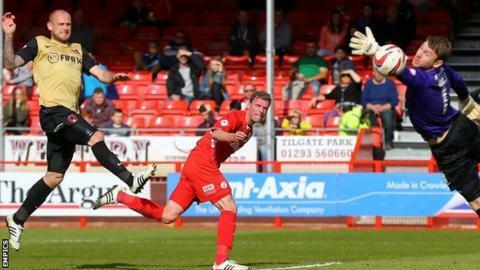 Crawley Town's third consecutive win put an end to Leyton Orient's hopes of earning automatic promotion. Both sides wasted early openings but the O's, who have now won once in seven games, fell behind when Gwion Edwards fired a low shot into the corner. David Mooney then went close for the visitors, who equalised through a toe-poked effort by Chris Dagnall. But Andy Drury's header from a Mike Jones cross ensured victory for mid-table Crawley. Mooney might have levelled for Orient, but his low shot was saved by goalkeeper Paul Jones and the striker also had an injury-time shot cleared off the line. A point would have meant that the O's could still have drawn level on points with Brentford. But their win over Preston North End, coupled with Orient's defeat and Rotherham's loss at leaders Wolves, means the Bees are promoted to the Championship. "We deserved the victory today, we knew it was going to be difficult and today was a very close game. "I'm so proud of our boys, we've played three games in seven days. It's been a monumental ask. The way they wear the shirt makes me proud. "Kyle McFadzean is my John Terry, he's been amazing for this football club. I was exceptionally proud of his performance today." Match ends, Crawley Town 2, Leyton Orient 1. Second Half ends, Crawley Town 2, Leyton Orient 1. Hand ball by Jamie Proctor (Crawley Town). Corner, Leyton Orient. Conceded by Kyle McFadzean. Attempt blocked. David Mooney (Leyton Orient) right footed shot from a difficult angle on the left is blocked. Substitution, Crawley Town. Sergio Torres replaces Josh Simpson. Attempt missed. Dean Cox (Leyton Orient) left footed shot from outside the box is close, but misses the top left corner. Attempt saved. Josh Simpson (Crawley Town) right footed shot from the centre of the box is saved in the bottom right corner. Attempt saved. David Mooney (Leyton Orient) right footed shot from the centre of the box is saved in the bottom left corner. Attempt saved. Josh Simpson (Crawley Town) right footed shot from outside the box is saved in the bottom right corner. Attempt missed. John Lundstram (Leyton Orient) right footed shot from outside the box misses to the left. Goal! Crawley Town 2, Leyton Orient 1. Andy Drury (Crawley Town) header from the centre of the box to the bottom right corner. Assisted by Michael Jones. Foul by Mark Connolly (Crawley Town). Shaun Batt (Leyton Orient) wins a free kick in the defensive half. Substitution, Leyton Orient. John Lundstram replaces Lloyd James. Corner, Crawley Town. Conceded by Mathieu Baudry. Corner, Crawley Town. Conceded by Jamie Jones. Attempt saved. Gwion Edwards (Crawley Town) right footed shot from outside the box is saved in the top right corner. Substitution, Crawley Town. Jamie Proctor replaces Matt Tubbs. Attempt missed. Matt Tubbs (Crawley Town) right footed shot from the centre of the box is just a bit too high. Attempt missed. David Mooney (Leyton Orient) right footed shot from outside the box is close, but misses to the right. Mark Connolly (Crawley Town) wins a free kick in the defensive half. Michael Jones (Crawley Town) wins a free kick in the defensive half. Corner, Crawley Town. Conceded by Nathan Clarke.